← Does DrJava Work on Mac OS X Lion? A radio station here in Seattle (I believe it KOMO News) had checked how many minutes of summer Seattle had so far in 2011. They defined summer as 80 degrees Fahrenheit (27 C) and no rain. Guess how many? When someone complained that 80 degrees is kind of warm, and that summer already begins earlier, they checked for 75 degrees F (24 C). How much time? 18 hours. Not even a full day. But today definitely is summer. 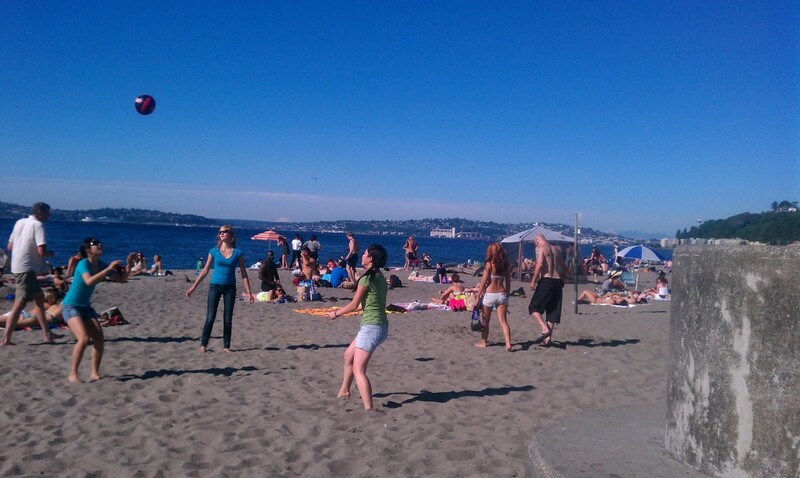 All of Seattle was at Alki Beach, it seemed. It looked like the Playa della Something in Mexico or Spain. I ran 3.5 miles slalom around people, but I must have done something to my left foot, because my ankle hurt pretty badly. And I mean that, because running 3.5 miles a day is a piece of cake by now. Alki Beach in July 2011. Same amount of Space Needle, many more women in bikinis.